On May the 5th the Trollbeads Uniques Leather Bracelets are coming out. They will be $39 USD and that’s for both the bead and the leather strap, in case there’s any confusion. The leather is thicker than the ones that came out a couple of years ago. Feel free to check out my old blog post here, where my friends and I made a video copying the Trollbeads one, for fun, to show how to cut the leather to size. This time the bracelets, which are super for casual summer wear, come in nine colours. This picture below has the truest capture of the colours. Each one comes with a Universal Unique, which has a larger core than regular Trollbeads. Even so, they don’t move around on the leather at all. Here is my old white one on the right with the new white one on the left. I wanted to show the difference in thickness. Also, considering I wore the older one around Southeast Asia when it was sometimes over 40C and humid (blech! ), the leather has held up really well and isn’t even too dirty looking, especially considering the amount of sweat and sunscreen it was exposed to. You can see how thick the knot is on the left. It is very comfortable though as it’s fairly soft. The way I’ve been getting these ones on and off is by keeping the knot done up and slipping it through the slit. 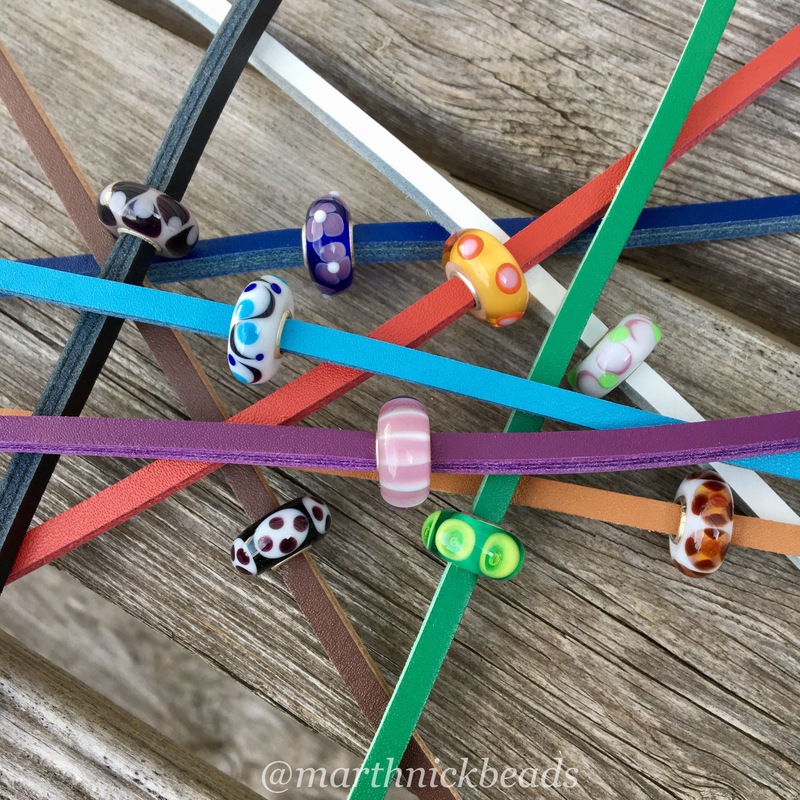 In my other blog post I explain different ways you can get them on and off, but I’m going to stick to this method for now and that’s how my friend Cheryl puts hers on. To be clear, regular Trollbeads will not fit on these, although some silver pieces might. Also, I had a hard time getting other branded glass beads on, but a few silver pieces will fit on. Having said that, I’m going to be keeping these as is, because I think they will make for a quick addition to a combo. Obviously I was most excited about the purple. I think it pairs nicely with X Jewellery, especially for warmer weather. Wearing three at once means lots of knots underneath, but again, the leather is pretty soft and comfortable. So, as to where to buy these it’s going to vary. Trollbeads.com won’t be selling them as it would be too difficult since the bracelets come with a variety of glass beads. The Trollbeads branded stores will have them. Places like Perlen and Star Bijou are going to sell them and Blooming Boutique Beads already has some listed. They have put beads online by colour group, so you choose the bead and then it comes with the corresponding leather bracelet. The initial listing is at one of their online parties here. 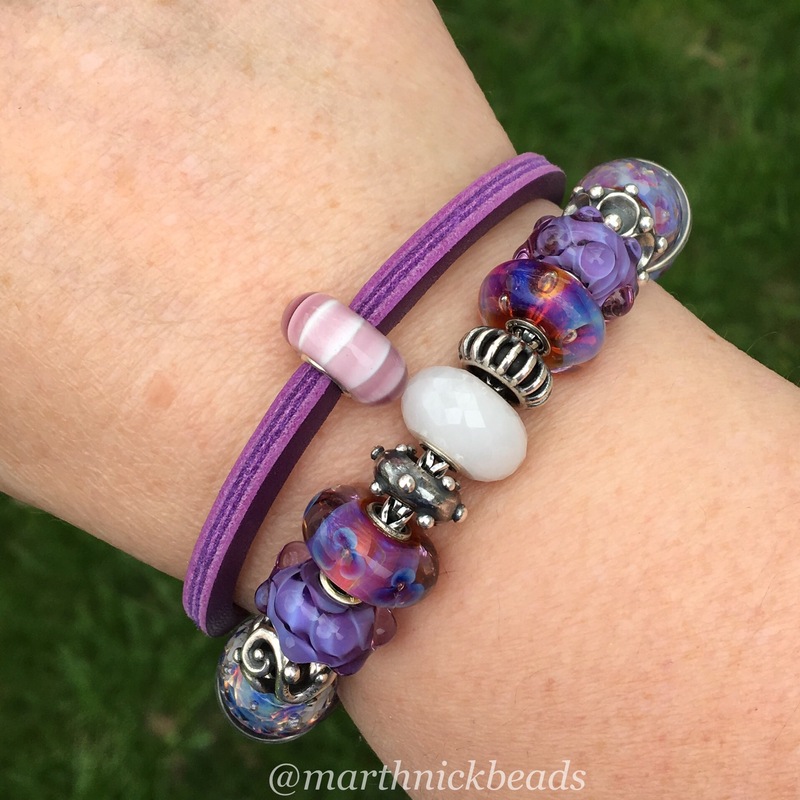 I really like the beads that came with these bracelets, especially the ones on the turquoise (lighter blue one) and purple bracelets. Is anyone planning on getting one? If you have any questions, please ask and I’ll try to help! a few of them eventually; especially the purple. Is this a limited offer, do you know Martha? I’m afraid any “Bead Budget” I had for this month is already spoken for. Hi Suzanne! Don’t worry about rushing as these are not a limited release. And maybe only buy one if you have to do it online, so you can see if it’s easy enough to get on and off, before buying more. They really are lovely to wear though, lightweight and soft! I love that you took live images of all 9 of them! 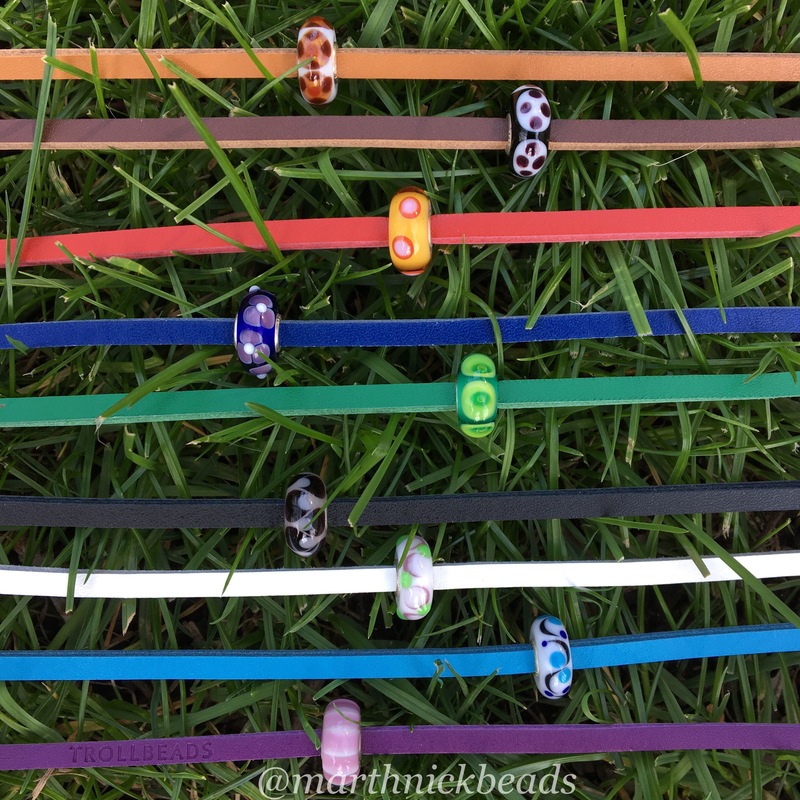 These are a really fun pop of color and a great idea for those days you just need to rush outside while slipping on a bracelet. I’m partial to the turquoise one! I’m going to see it in person and see if my local store has a Universal Unique bead that catches my eye. I agree April, they are a really fun pop of colour. It’s great that you will be able to see them in person! 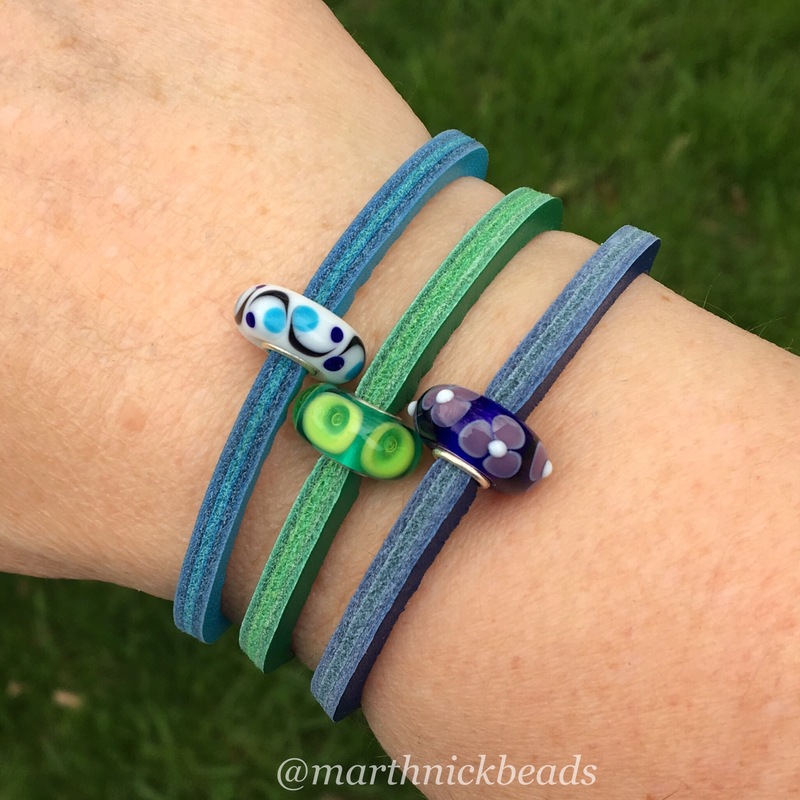 I think I need to try a purple and turquoise glass bracelet with the corresponding leather colours. So many possibilities! Loving the new site design first of all. 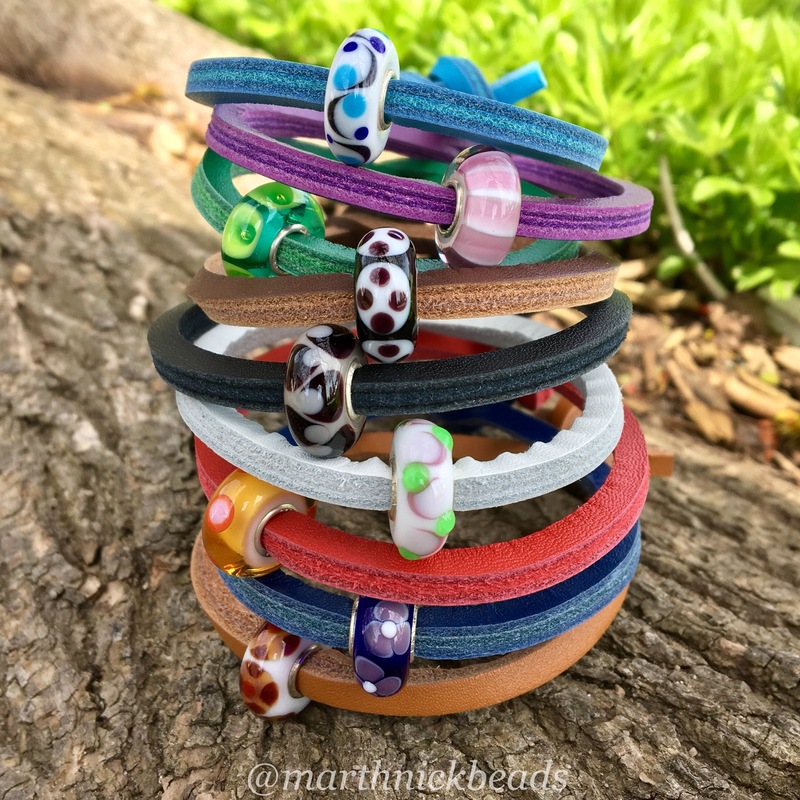 Although I am obsessed with these colors and the idea of these amazing colors in a leather charm bracelet, I hate all the rules that come along with it ( no clasp, no lock, no regular tb glass, no other glass) It’s rare I think any bead brand should take a page out of Pandora’s book however in this case I think they should. 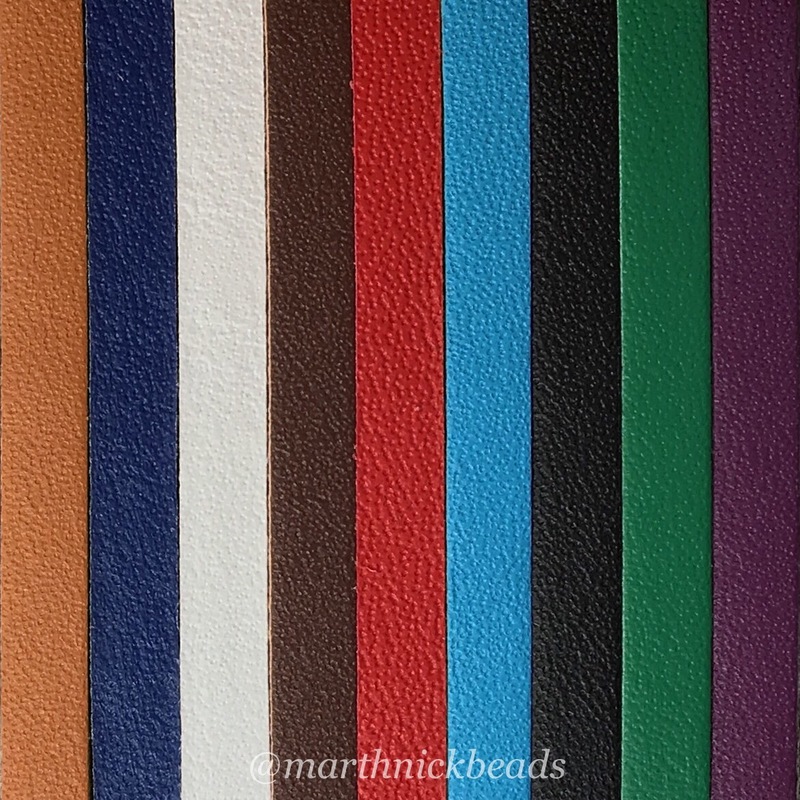 Tb leather quality along with awesome color in a more universal style leather would be a huge hit. Definetly a pass for me. Thanks for showing everyone the differences so people can know what to expect. Hi Alex! Yeah, I was playing around with WordPress themes last night. I hear you about the leather. I think the ultimate leather bracelet for me would be as you say, the Trollbeads leather in a single style with a lock. 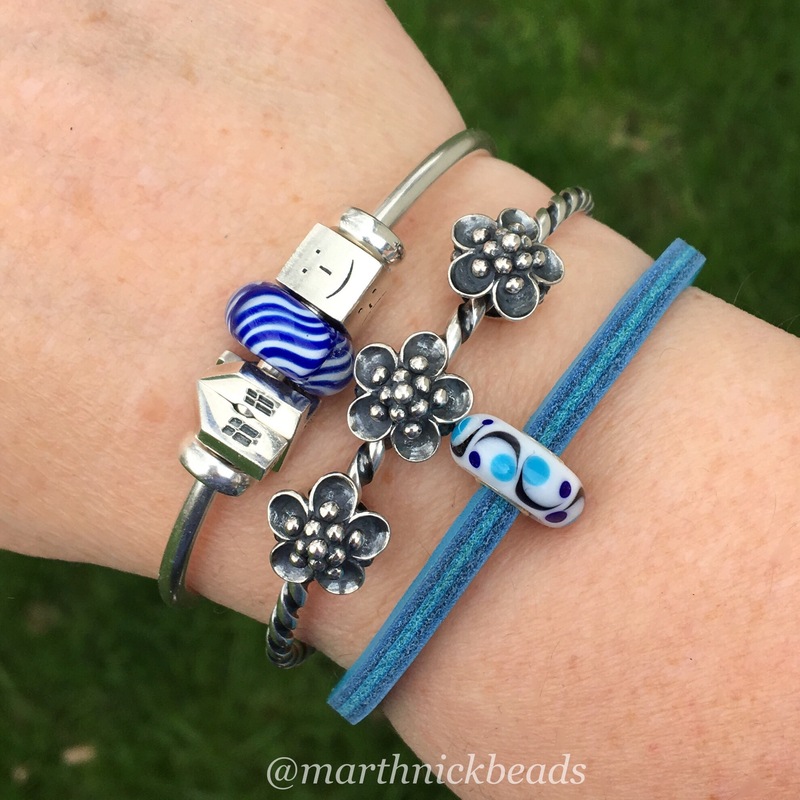 I like the Pandora ones but you can’t put on Trollbeads. I sure love the pop of colour these ones give, though! Exactly what you wrote was exactly what I was thinking just didn’t express accurately ( I absolutely love your ultimate bracelet idea ) I wish it could fit all glass though big and small. Perhaps next year trollbeads will release this style leather but with a clasp not lock? Any chance these knots come undone and you lose the bracelet ??? I wore these all weekend and the older style ones quite and bit and must say the knots have never come loose. I wouldn’t load them up, mind you, although I’m sure some people do. I pull the knot pretty tightly! Hi Martha! I love your new WordPress theme. It’s very pretty as are the bead designs. I think my favorite is the three bracelets with the X jewelry featuring the purple leather. I don’t have any leather bracelets other than Pandora, but may have to try a Trollbead leather sometime. Speaking of Pandora, I’m anxious for the new leathers to come out with the round clasp. Hi Dawn! Yeah, I also like the look of the leather with the X Links. Maybe it’s the combination of textures that’s appealing. Leather bracelets must be a popular item for summer, as it seems to me that’s when Pandora always releases theirs, too. Can’t believe it’s already May! I saw that large knot in the leather and thought “hey, a better looking sea band”. Sea bands are nasty looking knitted cuffs (like tennis players wear) that have a button on the inside that presses into the P6 acupressure point (located three finger breadths below the wrist on the inner forearm in between the two tendons). The knob on the sea band is roughly 1.5 cm (14mm) in diameter and is .5 cm (6mm) deep. 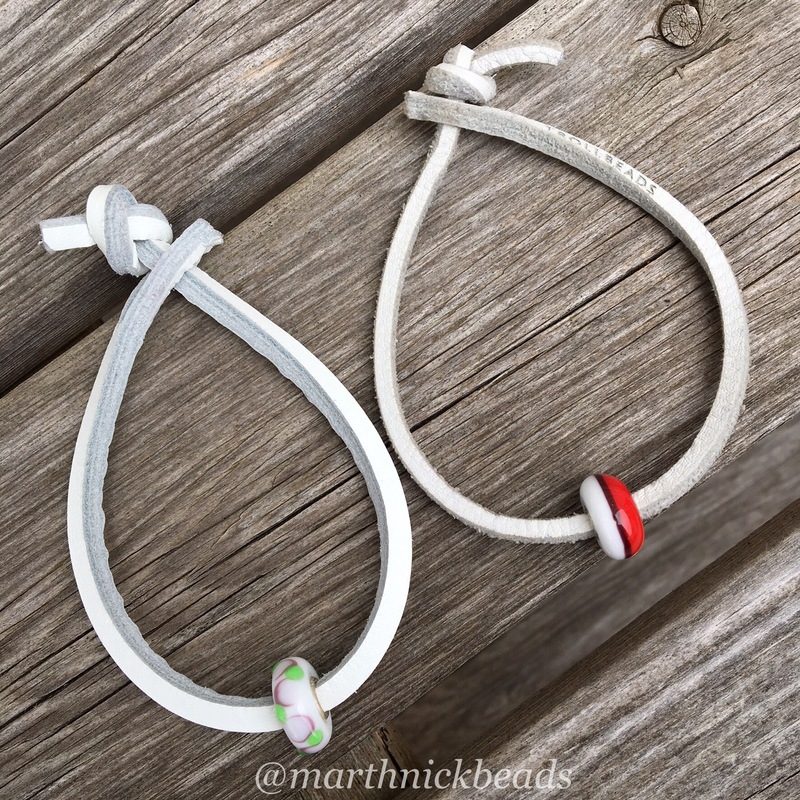 Is the bracelet knot similar in size? 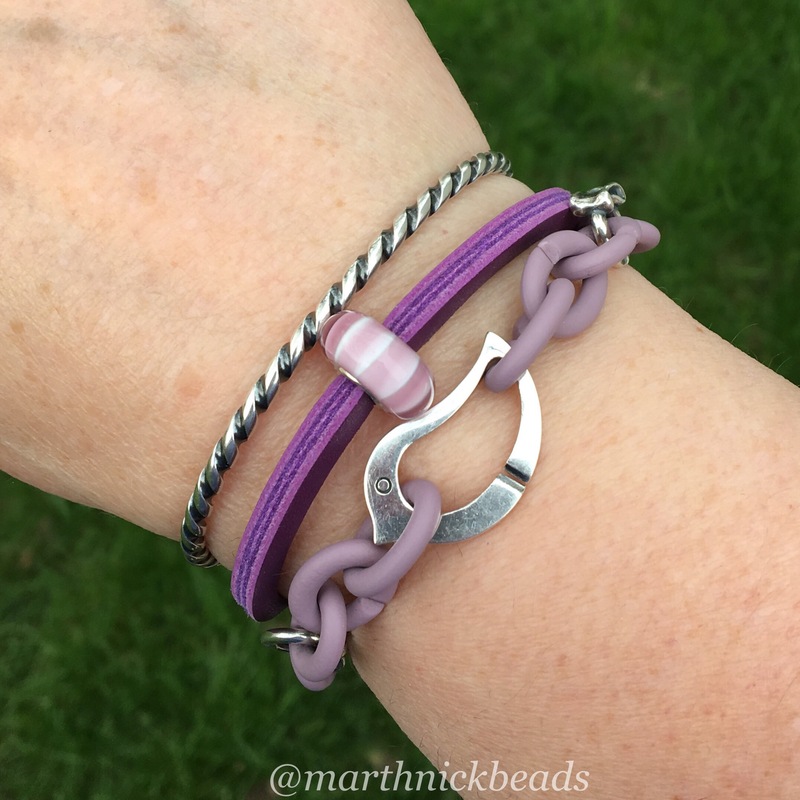 I would have to shorten the bracelet so it is very tight around my arm at the P6 area …. but it would be great to be sick in style. What an intriguing idea! I just measured the knot and mine is 16mm long by 10mm wide, but I bet you could pull it tighter and manipulate it a bit.